We are sitting for almost 9 hours a day on average on chairs designed in ancient Egypt which were only used by Pharaohs for short periods of time to be physically above their subjects. Conventional chairs just don’t do us any good. If you sit at a desk all day, chances are pretty high that you have some kind of back, neck, shoulder or wrist pain. And if not chances are even higher that it’s only a matter of time. The human body is not designed to sit. It’s normal, but it’s definitely not natural. So how do we improve posture at work? My Alexander Technique teacher, Jonathan Drake, states that our habits of sitting at the computer grew out of our early experiences of reading and writing; that how we do anything is conditioned by our habits which feel comfortable to us. He made me aware that the conventional approach to ergonomics encourages this – that the back should be directly supported – and you’ll continue to hear it today from health and safety idiots in the workplace. However this leads to the core muscles weakening to the point where the seat back becomes required. The body’s centre of gravity ends up behind the sitting bones rather than over them which is an unstable position and places increased pressure on the lumbar discs, stretching ligaments and muscles supporting the spine and putting pressure on internal organs. This actually makes breathing and digestion more difficult and the heart has to work even harder to pump blood around the body. The problem is that the human pelvis can not physically tilt 90 degrees and so the remaining 30 degrees or so required in order to sit at a flat seat in an upright position is done with the lower (lumbar) spine. 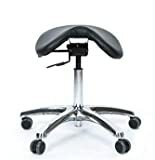 This backwards pelvic tilt can be prevented by using a seat wedge or a saddle seat which is the most ergonomic computer chair you can have and is what I use which can also come with a footstool for desk use. SADDLE SEAT SHAPE. Saddle seat shape incorporates a waterfall effect allowing the legs to hang naturally from the stool while sitting, thus reducing pressure on the backs of the thighs, for greater comfort and improved circulation to the lower legs. Its ergonomic shape promotes correct spine posture and helps strengthen core muscles for a stronger back. The seat's tilting mechanism allows the user to set the sitting angle they re most comfortable with. STURDY STEEL CONSTRUCTION. Tubular metal frame and components accommodate users weighing up to 250 lbs. EASY-CLEAN MATERIAL. Durable pleather seat cover is easily wiped clean, for a quality appearance that stays looking good. This ensures that your hips and thighs are higher than your knees and that your hamstrings aren’t stretched (which also causes the pelvis to be forced backwards). With a traditional / ‘normal’ chair the chair height should be 30% of your own height; with a saddle chair it should be 35-40% of your height. 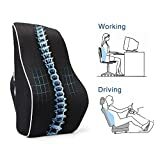 This enables you to actually sit on your sitting bones (centre of gravity on your sitting bones) and allows the pelvis to become the foundation for your spine (rather than tilting back) and allows your spine to retain the natural S shape of standing (same pressure on discs as when standing). 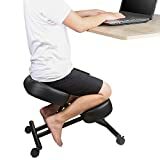 So how to improve posture at work desk? If your desk is too low (likely) to have you sitting at 30-40% of body height then you will need to use blocks underneath or raise the desk height using box files. When sitting, the top of your laptop screen needs to be at eye level and the screen slightly angled up so that your gaze is slightly down and your head is able to tilt forward on the top of your spine. In order to do so you need to raise that laptop up and get a separate keyboard and mouse. 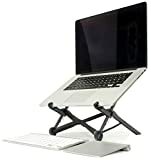 The successful kickstarter project Roost Stand by James Olander offers a great solution, especially when you’re on the go and don’t have other objects at your disposal to elevate your laptop. Besides, using objects such as books underneath can overheat your machine. The company is currently working on version 2 and I’ll likely get one. In sitting, your elbows need to be slightly higher than wrists (opposite when standing), your forearms need to be horizontal (sloping up when standing) to ensure your wrists are released. By sitting on a wedge or saddle seat, your head, neck and torso can pivot forward over your sitting bones and your chair becomes a perch rather than a seat so that you should be able to stand up at any moment. As well as sitting with a bent lower back, we also end up sitting with a bent upper (thoracic) spine. The top part of our spine from our rib cage to our neck is rounded forward at our desks and so when we stand up this rounded position becomes the new normal as the musculature around the spine moulds to this position so that we literally cannot stand up straight anymore. The result is that for our head to become upright we overcompensate by pulling our neck back putting a ton of pressure on our neck (facet) segments. To compensate for this tendency you need to make sure you’re not leaning / leading with one arm as you type. 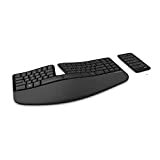 For me, as I’m right handed and use the trackpad with my right hand, I have a tendency to lean in and rotate to the left with my right hand / arm / shoulder. This creates an imbalance and tips the right shoulder forward and rotates the scapula (shoulder blade) upwards and into an unstable and internal rotated position (explained in chapter 4). To compensate your pec minor has to overwork and will end up super tight and locked to the point where ironically you actually lose internal rotation ability and will find it hard to scratch behind your back. A quick hack to reset your shoulders into the back of their sockets I’ve found is to reach both arms out in front of you and grab both sides of your laptop screen at the top. Try to (externally) rotate your arms (at the shoulder) to get your elbow crease up towards the ceiling. This is a stable position. Then shift your elbows directly backward (just passing your body) and you should find your wrists and forearms are a lot more straight and elbows tucked much more in. Another way of understanding this is to sit down, grab both of your knees, then try and sit as upright as possible. Notice how your shoulders sink back and your elbows turn in as you do this. Now reach your hands out to your keyboard and try and maintain this solid, externally rotated position. It should look and feel as if you are holding a kettle-bell out in front of you.